Carrier Transicold UK is helping customers get the most value from its range of refrigeration units by creating a suite of training videos. The videos are intended for operators of Carrier Transicold truck and trailer refrigeration units, including Vector™, Supra™ and Pulsor™ technologies. Carrier Transicold helps improve global transport and shipping temperature control with a complete line of equipment for refrigerated trucks, trailers and containers, and is a part of UTC Building & Industrial Systems, a unit of United Technologies Corp. (NYSE: UTX). The short videos, which are available online, are designed to help customers follow recommended operating procedures and eliminate errors such as fuel contamination, debris in evaporators and potential unit damage, all of which can help reduce equipment-running costs and downtime, improve operational efficiency and avoid common mistakes that can compromise the integrity of perishable cargo. Training videos are also available for Carrier Transicold’s range of Neos™, Viento™and Xarios™units, along with specific videos for the optional rear control panels available for the Vector and Supra units. 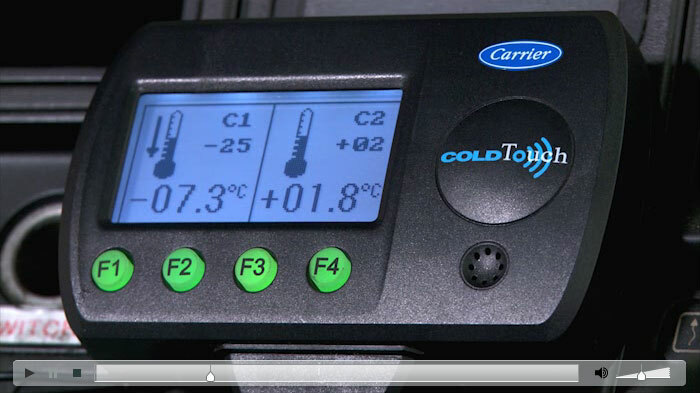 There are also specific videos on operating the variety of accessories offered by Carrier Transicold, including COLDTouch, which uses Bluetooth technology to display the temperature of the trailer on a screen in the tractor unit cab, and DataCOLD, an independent temperature recorder that works separately from the refrigeration unit, so operators know the correct temperature has been maintained over the course of a journey. The training videos are packaged together on a USB flash drive available on request and also are available online at https://carrierdealer.co.uk/productinfo/unitoperationvideos.asp. “Our expert team is always on hand to offer advice on training or unit operation, but we believe our customers will find the videos a useful tool which they can incorporate into their existing training practices and access 24/7.” Forster said. Carrier Transicold is showcasing a prototype of a natural refrigerant trailer unit at the International Motor Show (IAA) 2014. This marks an important milestone in the development of over-the-road refrigeration using a natural refrigerant. Carrier Transicold, which operates in the UK as Carrier Transicold UK, helps improve global transport and shipping temperature-controlled cargoes with a complete line of equipment for refrigerated trucks, trailers and containers, and is a part of UTC Building & Industrial Systems, a unit of United Technologies Corp. (NYSE: UTX). Summit to feature interactive discussions and preliminary results of global cold chain study. More than 800 million people worldwide go to bed hungry, while one-third or more of all food produced never reaches consumers due to spoilage and waste, according to the Food and Agriculture Organization of the United Nations. Against the backdrop of World Food Day and in response to this issue and its resulting 3.3 billion metric tons of carbon dioxide emissions, Carrier, the world's leader in high-technology refrigeration solutions, announces its inaugural "World Cold Chain Summit to Reduce Food Waste" in London on Nov. 20. Carrier is a part of UTC Building & Industrial Systems, a unit of United Technologies Corp. (NYSE:UTX). The conference will convene global leaders in academia, government and business to discuss food waste in emerging and developed economies. Participants will identify actions needed to accelerate progress in cold chain technology and policy development. Keynote speakers include Philippe Cousteau, environmentalist and grandson of the undersea explorer Jacques Cousteau, and Barton Seaver, National Geographic fellow and director of the Healthy and Sustainable Food Program at the Harvard School of Public Health. The cold chain, which includes marine container refrigeration, truck and trailer refrigeration and food retail refrigeration, enables global food to remain fresh for safe consumption from farm to store. "With new technologies and practices for a more efficient cold chain, significant progress can be made to reduce global CO2 emissions, improve cross-border economic activity and help reduce hunger," said David Appel, president, Carrier Transicold & Refrigeration Systems. "We are proud to convene and engage experts across private and public sectors to collaborate on developing actionable strategies to reduce food waste." "A green cold chain is an essential strategy to not only extend food supplies, but also reduce the significant emissions produced by food waste every year," said John Mandyck, chief sustainability officer, UTC Building & Industrial Systems. "If food waste were a country, it would be the third largest emitter of greenhouse gases. We can meet the food needs of a growing planet with a simple equation — waste less, feed more — with substantial benefits to the natural environment." Also at the summit, researchers from the University of Nottingham will preview findings that are part of a new global research project sponsored by United Technologies. The research focuses on the transport, storage and retail display of refrigeration systems for perishable foods such as meat, fish, vegetables and dairy products, between producers and consumers in developed and emerging economies. "Issues contributing to food loss among developed and emerging economies vary dramatically," said Professor Tim Foster, University of Nottingham. "While emerging economies face significant challenges in energy and transportation, which are key to enabling an effective cold-chain infrastructure, food waste in developed economies is often behavior based. For example, a preoccupation with the aesthetics of food results in an estimated 20 percent of edible, but not necessarily pretty, fruits and vegetables going to waste." "We know that by 'greening the cold chain' – better managing the global food supply with existing cold chain technologies – we can help to reduce food waste, feed more people and substantially reduce the carbon footprint associated with the production and supply of food," said Appel. "This is what truly excites us, to serve a higher purpose of making life better for people around the world." Formal research findings from the University of Nottingham will be published in early 2015. For more information about the World Cold Chain Summit to Reduce Food Waste, or to register to attend, please email Jon Shaw at jon.shaw@carrier.utc.com. About Carrier Founded by the inventor of modern air conditioning, Carrier is the world's leader in high-technology heating, air-conditioning and refrigeration solutions. Carrier experts provide sustainable solutions, integrating energy-efficient products, building controls and energy. 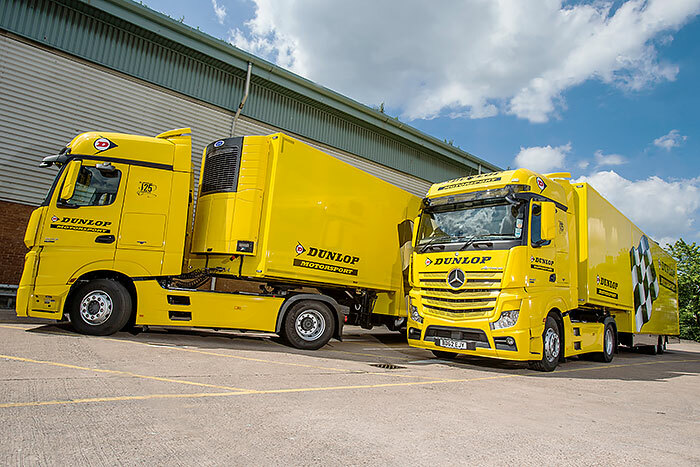 Dunlop Motorsport has added its first temperature-controlled trailers fitted with Carrier Transicold Vector™ 1550 units to its fleet to preserve the integrity of its racing tyres whilst in transit. Carrier Transicold, which operates in the UK as Carrier Transicold UK, helps improve global transport and shipping temperature control with a complete line of equipment for refrigerated trucks, trailers and containers, and is a part of UTC Building & Industrial Systems, a unit of United Technologies Corp. (NYSE: UTX). Dunlop Motorsport services more than 300 global racing events worldwide each year. The two new trailers from Birmingham-based M6 Motor Bodies will ensure its tyres are kept at a constant temperature, regardless of where they are being transported. The new trailers feature an innovative design that allows them to expand their width when parked. They are also fitted with special tyre racks to allow safe storage of tyres while on the move and on location. “The new trailers are the first of their type to enter Dunlop’s fleet, and we are looking forward to the positive impact the trailers will have,” said Chris Luckman, general manager, M6 Motor Bodies. Carrier Transicold’s Vector 1550 units allow for precise temperature control of +/- 0.8 degrees Celsius, and they heat or cool the load space, ensuring the set point is maintained in cold or hot climates. The units feature Carrier Transicold’s patented E-Drive™all-electric technology, which removes a large number of serviceable parts from the refrigeration cycle, substantially reducing maintenance and downtime compared with conventional belt-driven systems. 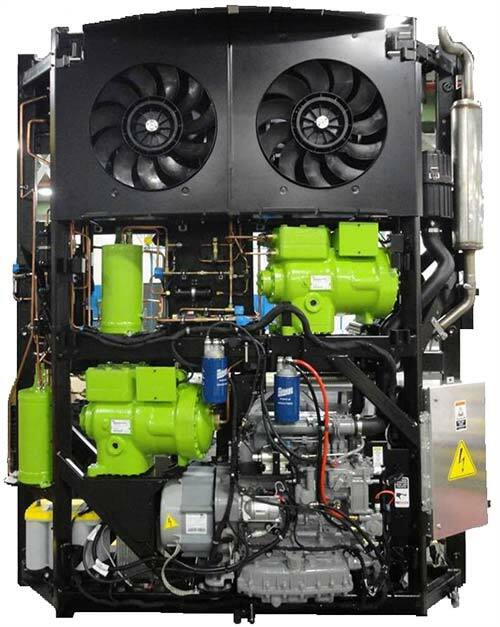 At approximately 740 kilograms, the Vector 1550 unit is one of the lightest refrigeration units on the market and will help Dunlop Motorsport optimise its payload capacity, whilst still offering all of the benefits associated with a temperature-controlled load space. Dunlop Motorsport also benefits from access to Carrier Transicold’s extensive pan-European after-care service, giving added reassurance as the trailers will spend significant time attending motorsport events across the continent. Dunlop Motorsport is the official tyre partner to the FIM Moto2 and Moto3 World Championships, as well as being the choice of champions in the car and motorcycle World Endurance Championships. 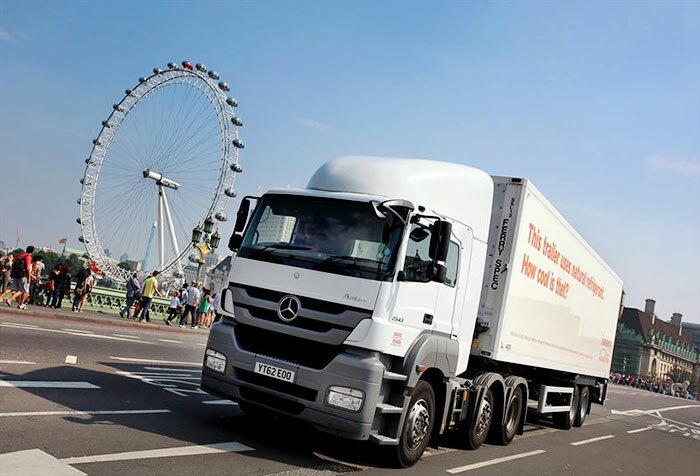 Motor Transport honoured Carrier Transicold with its prestigious Innovation Award for a joint project with Sainsbury’s to trial the world’s first temperature-controlled trailer using the natural refrigerant carbon dioxide (CO₂). Carrier Transicold, which operates in the UK as Carrier Transicold (UK) Ltd., helps improve global transport and shipping temperature control with a complete line of equipment for refrigerated trucks, trailers and containers, and is a part of UTC Building & Industrial Systems, a unit of United Technologies Corp. (NYSE: UTX). Labelled as “a potential game changer” by the Motor Transport judging panel, the two-year project launched in August 2013 uses a modified version of Carrier Transicold’s NaturaLINE™ refrigeration system, which was initially developed for ocean container shipping. The 10.8-metre, insulated, urban distribution trailer delivers frozen produce to stores using NaturaLINE’s non-ozone depleting CO₂ refrigerant, which has a Global Warming Potential (GWP) of one. In contrast, most temperature-controlled systems on commercial vehicles use conventional refrigerants such as R-404A (a fluorinated gas), with a GWP of 3,920. GWP is the measurement used to show the equivalent kilograms of CO₂. The GWP of CO₂ is lower than other natural refrigerants, such as propane, so even in the event of a leak, the use of CO₂ adds no new environmental risk. The award was received at the Grosvenor House Hotel in London by Victor Calvo, managing director, Carrier Transicold EMEA; Justin Grace, managing director, Carrier Transicold northern Europe; and Nick Davies, head of transport operations, Sainsbury’s. For further press information on the NaturaLINE trial, please visit the Carrier Transicold UK online newsroom. 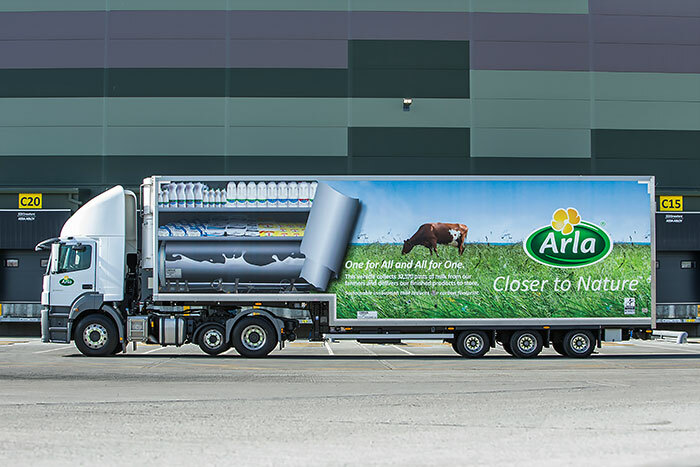 Arla Foods, the UK’s largest dairy cooperative, has increased the efficiency of one of its combination trailers since becoming the first-in-the-world to trial the latest innovation from Carrier Transicold. The technology has the potential to revolutionise the way temperature-controlled trailers are designed, cutting diesel fuel use and costs while reducing carbon dioxide (CO2) emissions. C arrier Transicold, which operates in the UK as Carrier Transicold (UK) Ltd., helps improve global transport and shipping temperature control with a complete line of equipment for refrigerated trucks, trailers and containers, and is a part of UTC Building & Industrial Systems, a unit of United Technologies Corp. (NYSE: UTX). Arla Foods’ tri-axle combination trailer — half refrigerated body, half milk-collection tanker — was modified by Carrier Transicold UK to power the milk-collection pump motors, eliminating the need for a tractor unit equipped with a power take-off (PTO), associated hydraulics and Suzi boom, thus reducing overall weight by 250 kg. Carrier Transicold tested, modified and developed new wiring configurations and software to establish an ‘export power mode’ on the Vector™ 1550 City trailer refrigeration unit, allowing the driver to disable the temperature control system for a short period of time to allow power to be routed to the milk tanker pumps. Since commencing a 12-month field trial in December 2013, the first proof-of-concept trailer has successfully reduced vehicle complexity and cut capital investment per tractor unit and trailer combination. The pumps are now powered by the Vector 1550 City unit’s 1.5-litre engine, versus the 11-litre truck engine used previously. This cuts diesel use per full load of milk from 3 litres to 1 litre, with the potential to save 1,460 litres per trailer per year. The Vector unit’s smaller engine operates on less expensive red diesel, generating further savings. It also saves on maintenance and repair costs as a result of the removal of the PTO and associated hydraulics. With fewer moving parts to break or require service, repair and maintenance costs can be significantly reduced, which, in turn, reduces any potential impact on service schedules or reliability. In addition, the combination trailer can operate with any tractor in the fleet – even spot-hire vehicles. The Vector unit performs these functions using its patented E-Drive™ all-electric technology, which transforms engine power into electricity through a generator. This electricity powers the Vector refrigeration unit while on the road. In addition, the Vector 1550 City unit operates below 60 decibels and complies with PIEK, Europe’s most stringent noise abatement standard, meeting the requirements of customers who need to make after-hours deliveries in and around residential neighbourhoods. Arla Foods’ collaborative involvement in this new innovation earned the company a place on the 2014 Motor Transport Awards ‘Best Use of Technology’ shortlist. For more information on Carrier Transicold and its products and services, visit www.transicold.carrier.com . Follow Carrier on Twitter: @CarrierGreen .